Everyone experience anxious and embarrassed feelings on occasion. However, when this becomes constant, it is a psychological condition. Social anxiety disorder is characterized by the overwhelming fear of being judged by others and being embarrassed in public. Social anxiety interferes with one's ability to face every day social situations, like parties, interacting with strangers, and eating in public. Anxiety disorders occur two times more in women than in men. This is most likely due to the hormone fluctuations women experience after puberty. Keep reading there are several helpful treatments for social phobia. Social anxiety typically starts developing during youth. Social anxiety disorder, also known as social phobia, is characterized by intense, self-conscious feelings in everyday social situations. People with social phobia have a strong fear of being watched and judged by others. They get embarrassed easily and have trouble facing social situations like public speaking, eating and drinking in front of others, and talking to people, especially strangers. Most people with social anxiety know that they shouldn't be experiencing this type of fear, but cannot control it. Social anxiety can be caused by previous emotional trauma, stress, and hormone fluctuations. Common symptoms of social anxiety disorder include rapid heartbeat, sweating, trembling, nausea, and avoiding social situations altogether in fear of being embarrassed. The first thing you should do if you think you are suffering from social anxiety doctor in order for them to properly diagnose you. Cognitive behavioral therapy is a type of psychotherapy that is popular for treating social anxiety. It teaches the patient a different way of thinking and behaving in social situations in order for them to feel less fearful and anxious. Anti-anxiety medication can be effective in treating social anxiety. Beta-blockers and benzodiazepines are commonly prescribed for social anxiety. Beta-blockers work by blocking the adrenaline hormone, causing the heart to beat more slowly and with less force. Benzodiazepines have a sedative effect on the nervous system. Exercising for around 30 minutes a day (or at least three times a week) has also been known to reduce stress, improve mood, and increase energy. Exercising releases feel-good neurotransmitters, like serotonin, in the brain. Yoga, walking, and swimming are all excellent low-impact workouts that are effective in combating anxiety. Making simple dietary changes can be beneficial to feeling your best. Including protein, fiber, fatty acids, and fruits and vegetables into meals is ideal for optimum performance and boosting energy. Valerian, kava root, and passion flower are sedative herbs that have been known to reduce anxiety symptoms. Social anxiety can range from mild to severe and interfere with relationships and the ability to face common social situations. 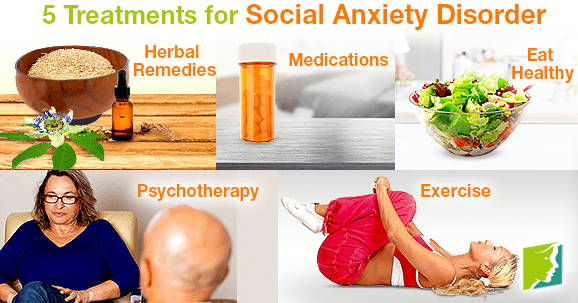 There are many treatment options that have been shown to be beneficial in treating social anxiety, like psychotherapy, exercising, and trying herbal remedies. Prescription medication, like beta-blockers, have also been known to be effective in treating social anxiety.